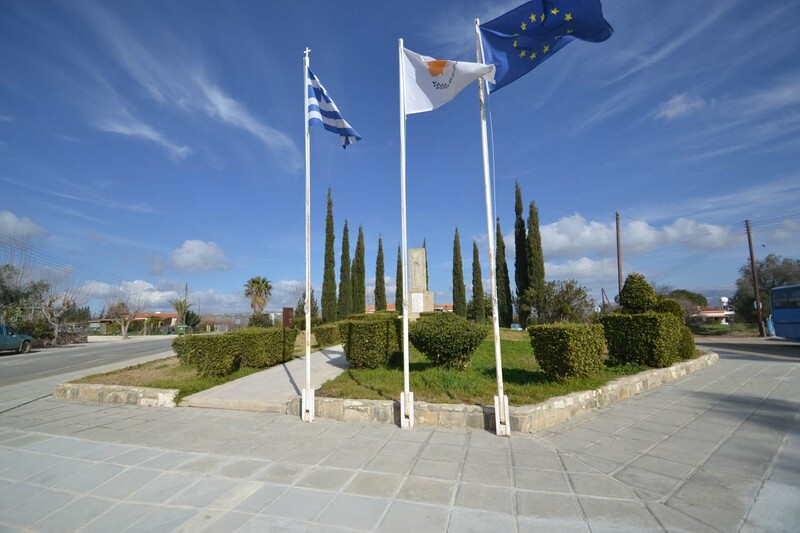 There are two heroes’ monuments in the village. 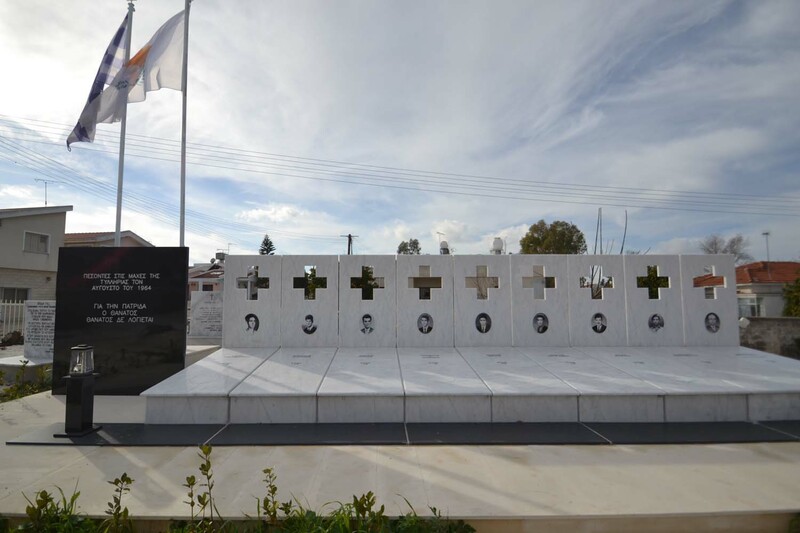 The first one is dedicated to “Freedom”, and the second one to the hero, Dimitrakis Ioannou. 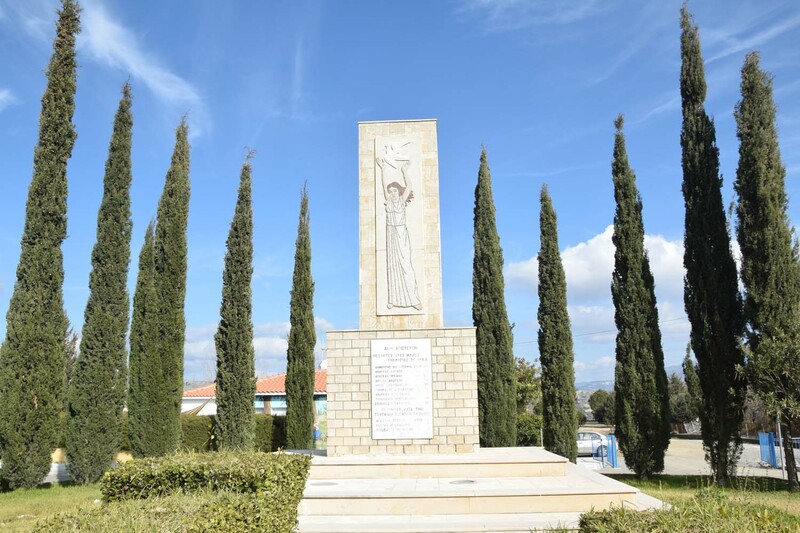 The Liberty Monument is next to the Gymnasium of Polemi and is dedicated to all the heroes of Polemi who died fighting for the highest value, for freedom. It is decorated with a tessellation depicting “Freedom” holding a white dove in her hand. There is also an inscription with the ancient Greek saying: “ALWAYS (TRY TO) BE THE BEST”. Andreas Michael: He was born in Letympou. Married in Polemi and had a child. He went to Polemi Gymnasium. He showed a fighting spirit during the 1955-1959 liberation fight. He became a corporal in 1960 and in 1964 he took part in the Kokkinia-Mansoura operation. He was killed on the 9th of August of the same year. 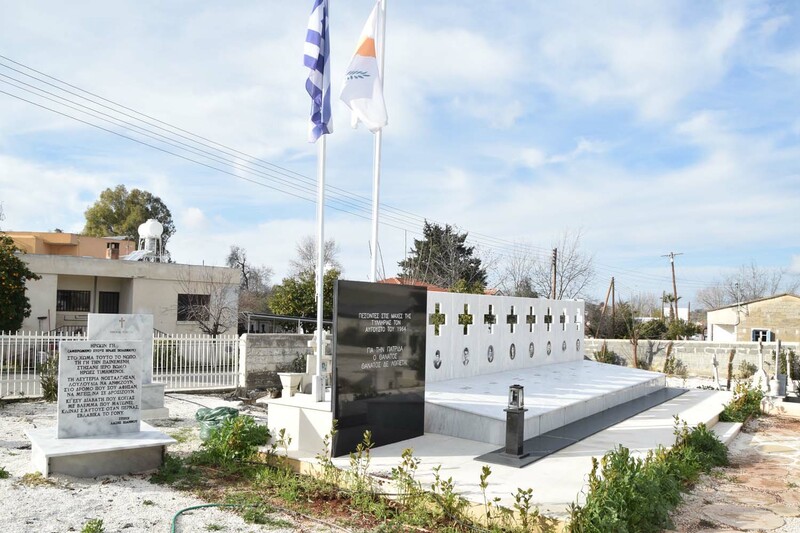 Yiannakis A. Ioannides: He was born in Polemi. He went to Polemi Gymnasium and continued his education in Paphos. He joined the 85th company in Polemi and took part in the Kokkinia-Mansoura operation. He was seriously injured on the 9th of August 1964 and died a month later. Andreas Lardou: He was born in Letympou. Married in Polemi and had two children. He joined the 85th company in Polemi and took part in the Kokkinia-Mansoura operation. He was killed on the 9th of August 1964 in the Kokkinia-Mansoura operation. Phrixos Andreou: He was born in Psathi in Paphos. He went to Polemi Gymnasium only for three years due to family obligations. He took an active part in the 1955-1959 EOKA liberation fight. He served as a team leader in the 85th company of Polemi and in 1964 he took part in the Kokkinia-Mansoura operation. He was killed on the 9th of August 1964 at the age of 23. Nicos Polycarpou: He was born in Polemi. He went to the A’ and C’ Paphos Gymnasium and the Athens Male Gymnasium. He voluntarily joined the 85th company in 1963. He was killed on the 9th of August 1964 at the age of 19 in the Kokkinia-Mansoura operation. Tilemachos Christodoulou: He was born in Polemi and went to Polemi Gymnasium. He voluntarily joined the Kokkinia-Mansoura operation on the 9th August 1964. He was killed at the age of 18 at the Kokkinia-Mansoura bombings. Andreas Thoucydide: He was born in Polemi and went to Polemi Gymnasium. He voluntarily joined the 85th company in Polemi. He was killed on the 9th of August 1964 during the Kokkinia-Mansoura operation. He was only 18 years old. Stephanos Savva Zaloumis: He was born in Polemi. He went to Polemi Gymnasium and then to the Morphou Agricultural Gymnasium. He was killed, at the age of 18, during the Kokkinia-Mansoura operation. Arestis Sergiou: He was born in Nata in Paphos. 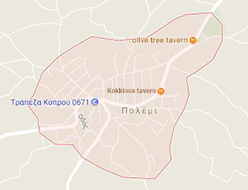 He went to Paphos Gymnasium and then joined the Police Force. He voluntarily joined the operation in Polis Chrysochous in 1974. He was ambushed, arrested and tortured to death, at the age of 30. Costas M. Savvides: He was born in Polemi and went to the Sanitary School of Athens. When he graduated, he was assigned sanitary inspector at the Sanitary Centre of Klirou in Nicosia. 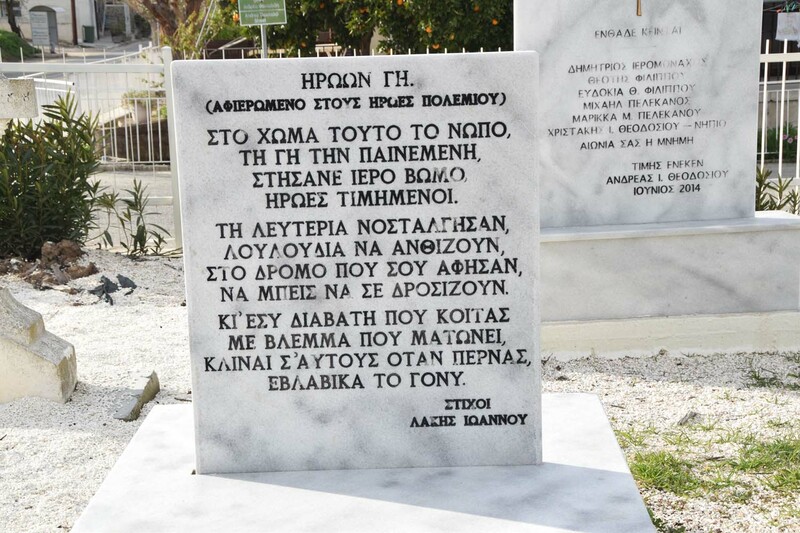 He died on the 22nd of July 1974 during the conflicts in Polis Chrysochous. He was 25 years old. Andreas Theodossiou: He was born in Polemi and went to Polemi Gymnasium. He studied architecture at Sivitanides School in Athens. In 1974 he joined the National Guard as a reservist. 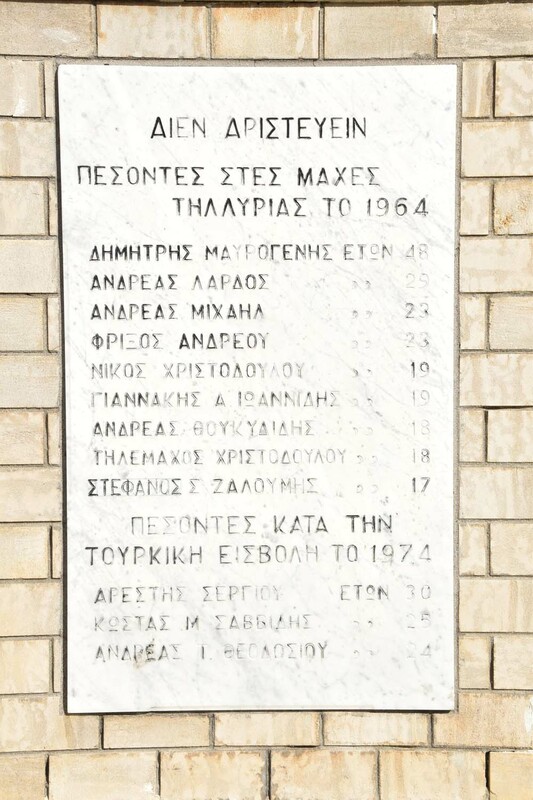 He was killed on the 22nd of July 1974 during the Polis Chrysochous operation. He was 24 years old. Dimitrios Maurogenis: He was born in Polemi and offered his medical services during the tragic events of 1964. He was died on the 9th of August 1964 during a bombing in Pachyammos, while helping patients. 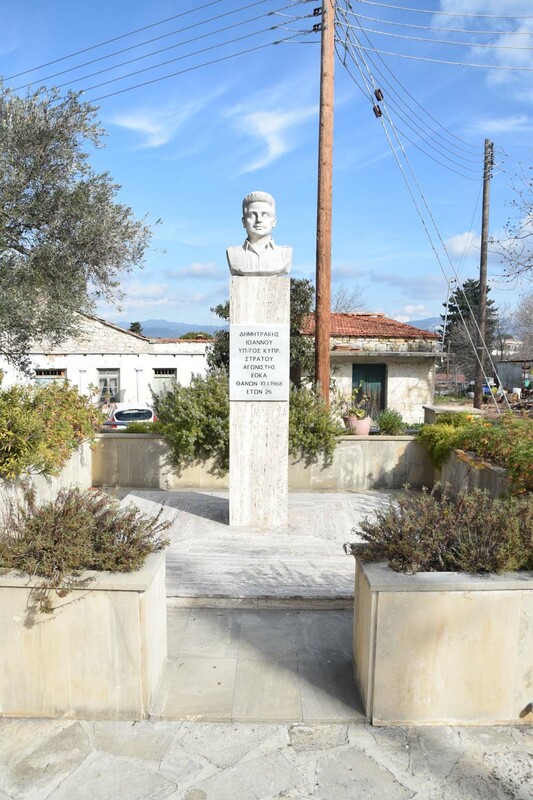 There is a Monument dedicated to Dimitrakis Ioannou in the parvis of the main church of the village. It consists of a stone bust on a marble basis. Dimitrakis Ioannou was born in Polemi and went to Polemi Gymnasium. As a student, he was an active member of the liberation fight. After the declaration of the Republic of Cyprus, he joined the army and became a lieutenant. He took part in the battles of Omorfita, Tympou and Kokkina. 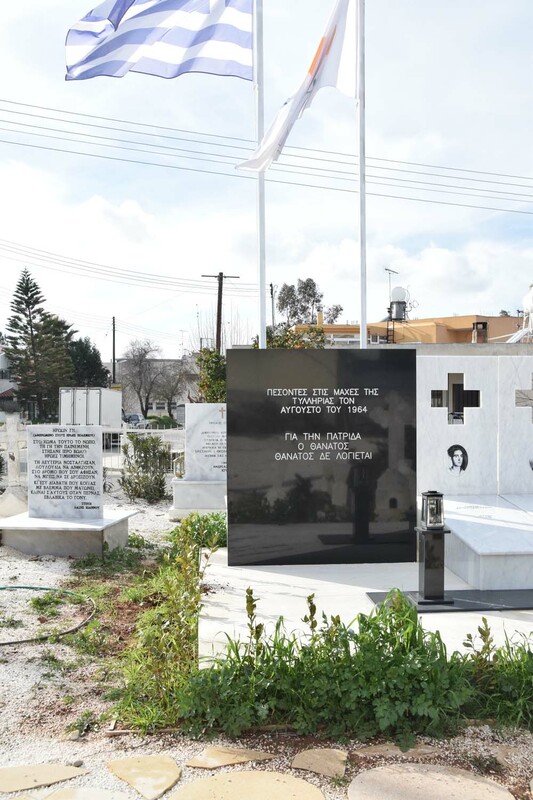 He died suddenly on the 10th January 1968, while serving the Cypriot army.